During his European tour, the Premier stressed the importance of international cooperation in production capacity. Premier Li Keqiang arrived in Beijing on July 3 after attending the 17th China-EU Summit and paying an official visit to France. The Premier said cooperation on aviation has become the model of practical cooperation between China and France. China and France will set up a fund to boost production and third party market cooperation, the Premier said. Premier Li said on June 29 in Brussels China is considering setting up a joint investment fund with the EU. In the China-EU Summit joint statement, both sides reaffirmed their commitment to deepening their partnership for peace, growth, reform and civilisation. Premier Li hailed the fruitful growth achieved through bilateral cooperation at a joint press conference with the Belgian PM. 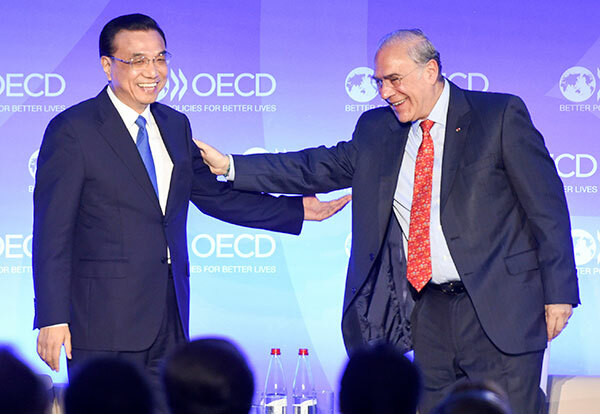 Premier Li Keqiang said that trilateral cooperation will benefit developing countries, developed countries and the world economy. Premier Li will attend the 17th China-EU Summit in Brussels and visit Belgium, France, and visit the headquarters of the OECD from June 28 to July 2.